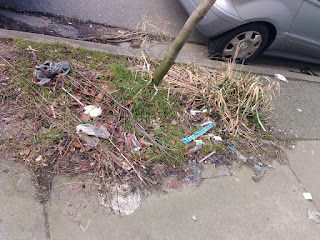 A collection of crud on 16th Ave, a block east of our house. Litter. Why is there so much crap on the road & sidewalks & alleys around here? Do people just drop it out of their cars before leaving? Do they litter as they walk? Is it really worse here than 'better' neighbourhoods, or is it just cleaned up less frequently in East Van? Car lots. Within a kilometre of our house, there are probably ten car dealerships. Most of them are car lots, huge swathes of impermeable oil-stained concrete with cars parked everywhere, (including one where they feel that the sidewalk also belongs to them & park on it regularly). They're gradually dying off & will probably eventually be replaced by condos, but I wish that would happen sooner. House prices. I know it's a desirable area & all that, but should you really need to kick down A MILLION DOLLARS to buy a house that isn't a fixer-upper? Why do developers think it's reasonable to build shoebox-sized condos on really busy intersections, then charge over HALF A MILLION DOLLARS for them? The intersection at Kingsway & Fraser. I walk through this crosswalk at least ten times a week & often witness drivers nearly hitting pedestrians. Sometimes it's me, sometimes it's an elderly person who's struggling to cross in the seconds allotted by the ridiculously short light. Nowhere else in this city that I've walked is there such a short pedestrian crossing light. Honking drivers. I hear cars honking a lot because apparently they have difficulty navigating the two-way stop at 16th Avenue & Carolina. The few times that I actually bother to look out the window at the apparent conflicts between drivers it usually just seems to be a f*ck-you honk because one of them isn't moving fast enough. That's NOT what car horns are for, people! Street parking entitlement complex. One of our neighbours seems to be under the misapprehension that she owns the street in front of her house. She will go to great lengths to convince people not to park in front of her house, including hitting their vehicles to set off the alarm, leaving garbage on the windshield or yelling at them. According to City of Vancouver bylaws, you do have the right to park within a reasonable distance from your home. I doubt the definition of 'a reasonable distance' is less than three metres from your front fence, however. Also, this particular neighbour has A DOUBLE GARAGE which she doesn't bother using most of the time. Sadly, I think that all the overturned buckets, stolen plastic City Works bollards & traffic cones sitting on the road in front of other peoples' homes are indicators of a similar sense of entitlement on other blocks around here. Smokers everywhere. I thought that in BC, the portion of the population who smokes was supposed to be around 15%. So why does at least one person in every single house around us smoke? In the winter, this is a non-issue, but in the summer when our windows are open, we get smoke filtering into our house quite often. Blech. Why Monday lists? Reading the lovely Chloe's blog, Tea Swamp Park, I found an idea I had to 'steal': a list of all her Halloween costumes, with quite a few photos. She got the idea from Hula Seventy's List Project. I've decided to do the weekly lists for a year that Hula Seventy is doing. People on this street also seem to think they own their street parking, but aren't as rude about it as in your area. Tricky when we have guests, because we have about 12 inches of frontage, other than our driveway!